Pakistan has promised to continue working with the United States in fighting terrorism and ending unrest in Afghanistan. But Pakistani officials say “any political or military” role for India in Afghanistan will be unacceptable. Prime Minister Shahid Khaqan Abbasi made the comments this week during a talk at the Council on Foreign Relations in New York City. Last month, U.S. President Donald Trump announced his “new strategy” for the Afghan war and South Asia. Trump said he supported more Indian involvement in Afghanistan -- something the Pakistani government has long opposed. “If they (India) want to do economic assistance, that’s their prerogative,” the Pakistani prime minister said. “But there’s no — we don’t accept or see any role politically or militarily for India in Afghanistan. I think it will just complicate the situation and it will not resolve anything,” he added. The Pakistani government claims the Indian intelligence agency is partnering with Afghan security forces. It accuses them of financing and plotting terrorist attacks against Pakistan through anti-state militants. Both Afghan and Indian officials deny the accusations. Pakistani officials said Abbasi also raised his country’s objections over the proposed Indian role in his talks with U.S. Vice President Mike Pence. The two men met in New York on Tuesday during the United Nations General Assembly. The meeting was the highest contact between Pakistani and U.S. officials since Trump gave his new strategy speech in August. He accused Pakistan of sheltering terrorists who carried out attacks against American forces in Afghanistan. The U.S. government provides billions of dollars in financial assistance to Pakistan. 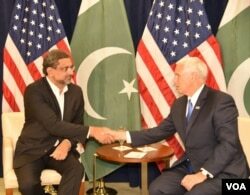 Bilateral meeting between U.S. vice president Mike Pence and Pakistan premier Khaqan Abbasi in NY Tuesday. After the meeting, Pence said he restated President Trump’s belief that “Pakistan has much to gain from partnering with our effort” in South Asia. While speaking at the Council on Foreign Relations, Abbasi repeated Pakistan’s interest in supporting a peaceful settlement to the Afghan conflict. He said that Pakistani security forces have destroyed all sanctuaries on its soil that reportedly were being used to carry out cross-border attacks. Separately this week, Afghanistan’s president suggested Pakistan was not doing enough to stop terrorism and prevent the Taliban from using Pakistani sanctuaries to plot attacks on his country. President Ashraf Ghani spoke at the Asia Society in New York. He repeated his offer of “comprehensive” talks with Pakistani leaders for settling their differences and working towards peace. Ghani praised Trump’s call for Pakistan to become a “responsible stakeholder” in the fight against terrorism. The Afghan leader has said that having a peace dialogue with Pakistan will eventually end the Taliban campaign against his government. Pakistani leaders dismiss those claims. They say the Afghan government needs to open talks with militants under an "Afghan owned and Afghan-led" peace process. They also say the Pakistani government will make all possible attempts to support the peace efforts. Pakistani officials say it is wrong for Afghan and U.S. officials to blame their country for the Afghan crisis. They say those claims are an effort to divert attention away from security and political "failures" in Afghanistan. President Trump also has warned that the U.S. government will not stay silent if Pakistan does not move against the suspected terrorist sanctuaries. Afghan officials say Pakistan supports the Taliban and its partner, the Haqqani network, in an effort to slow India’s growing role in Afghanistan. Afghan leaders, however, dismiss as unfounded Pakistani concerns about India’s growing ties with their country. They say no one will have permission to use Afghan territory against any country. Ayaz Gul wrote this story for VOANews.com. George Grow adapted the report for Learning English. Hai Do was the editor.